Stratton’s reputation for wide, open trails did not really hit me until my son and I stood at the top of the Sunriser Supertrail during a late-winter weekend visit to this classic southern Vermont ski resort. To my eye, the grand boulevard of Sunriser appeared to be as wide as a football field is long. A cautious skier, determined to use the whole trail to keep his speed under control, could start at the top on opening day and slide to a stop at the bottom on the last patch of snow in the spring. But at least the trail did not feel crowded during Stratton’s New Orleans-themed Marchdi Gras festival (scheduled for Mar. 28 this year), one of its biggest late-season events. Even as many ski areas start to wind down for the year, Stratton turns March into a continuous party. 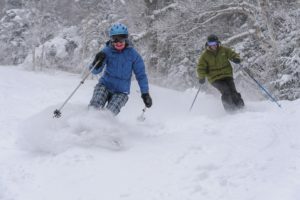 In addition to Marchdi Gras, the month features the Vermont Open Snowboard and Music Festival (Mar. 12-15) and the “24 Hours of Stratton” family carnival on Mar. 21-22. Cutting up the powder at Stratton. Stratton’s appeal for families is easy to understand. With nearly three-quarters of its trails qualifying as beginner or intermediate, it is well suited as a place to learn and hone one’s skiing abilities. That still leaves room for single- and double-black diamond pitches near the top of Stratton Mountain, which, at 3,875 feet, is the highest peak in southern Vermont. Among the green trails was one I welcomed: a glade called Daniel’s Web. The romance of gliding through snowy woods has long appealed to me. But glades at most ski areas are black diamonds. That’s understandable, given the likely winner of any collision involving a human and a tree. But how are you supposed to develop as a glade skier if there aren’t some easier tree trails in which to thrash about? Judging by my experience in Daniel’s Web, I’ll have to find many more glades where the ratio of trees to trail is heavily tilted toward the trail before I can move up to more challenging glades, but I’m happy to have made the close acquaintance of some very substantial birches and pines. Open since 1961 and counting novelist Pearl S. Buck among its original investors, Stratton has undertaken a $21 million program of upgrades and additions in the last two years. Prime among them is the $3 million replacement of the original 1988 gondola lift. The new gondola cabins, which hold 12 passengers, have a rubber-mounted frame that is intended to provide a smooth ride during the eight minutes it takes to climb from the base to the peak. As a member of the Intrawest group of ski areas, which includes Whistler and Tremblant, Stratton’s base area has that Intrawest instant-village feel, with a pedestrian walkway that winds past upscale storefronts, including new shops and restaurants that were added during the capital improvement program. With accommodations at the mountain, you could easily stay, ski, shop and steel yourself with food and drink without venturing beyond Stratton. But this part of the Granite State has other temptations. 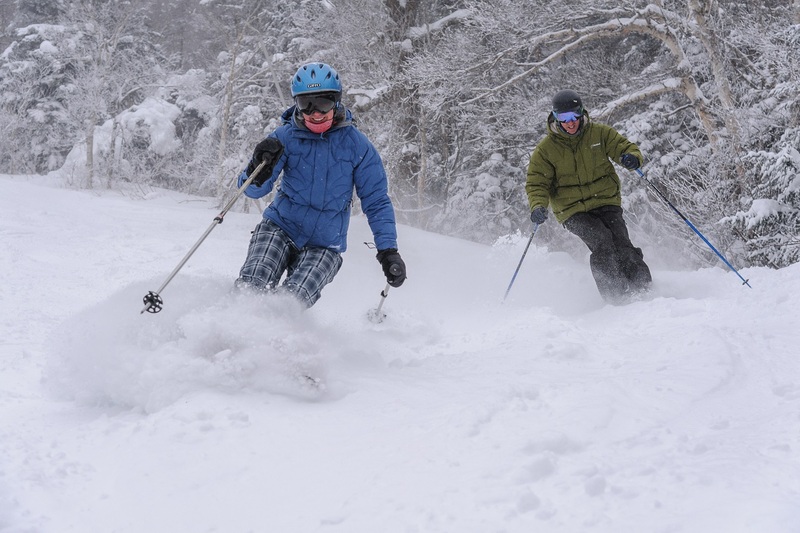 For one, Bromley Mountain Ski Resort is close at hand if you’re seeking a change of terrain. And Manchester, the largest nearby town, offers a variety of lodging choices and an array of arts-and-crafts shops, at the heart of which is the Northshire Bookstore, a sprawling bastion of the printed word. The restaurant scene is lively and varied, too, including Bistro Henry, which offers an eclectic mix of steak, seafood and bistro comfort dishes. The choice is yours—go for the full Stratton on-mountain experience, or mix skiing with a sample of Vermont village life. For more information, visit Stratton Mountain Ski Resort. Stevenson Swanson is a former National Correspondent for The Chicago Tribune.